Starting in late 2016, Wealth Research Group began dissecting the cryptocurrency economy, with the intent of sifting through the sea of projects to pinpoint the ultimate ones – the leading horses. We first covered Bitcoin at $400, thanks to its dominating role and established community. Then, we profiled Ethereum at $12 in March of 2017, thanks to its Smart Contract applications, and Monero at $19, thanks to its privacy advantages. We also interviewed the leaders of Dash when it was only $30, and I personally spoke with Charlie Lee, founder of Litecoin, when the price was a mere $20 per coin, as Wealth Research Group initiated coverage of both Dash and Litecoin. In December 2017, the last time we covered a cryptocurrency pick, our top idea was Ripple at $0.27. A month later, it was trading above $3.00. These were unbelievable gains, which may never repeat in scale or speed of occurrence, in a general sense, but some digital assets, the top dogs, have an incredible future ahead of them. In January 2018, Wealth Research Group published its top five altcoins for this year HERE & HERE. Cryptocurrencies witnessed the speculative bubble of Q4 in 2017 explode in a way that few asset classes have ever experienced. 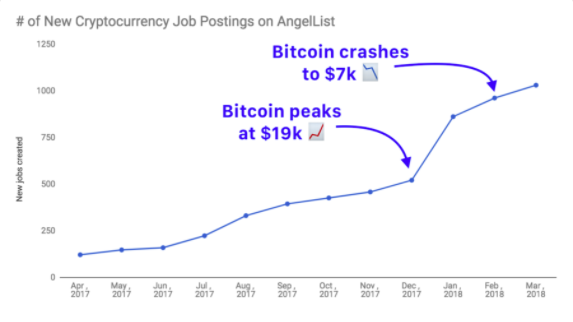 The real story, though, is in the number of new openings for blockchain-focused businesses. Regulations introduced by countries around the globe, central bankers’ interest in cryptocurrencies (over 90 of them are spending time and resources learning the crypto economy), and the technological innovation introduced by blockchain entrepreneurs is attracting institutional money into the sector. The potential of DLT (Decentralized Ledger Technology) to include the unbanked and undocumented in the global economy is the most apparent opportunity staring business builders and investors in the eye. The wealth generation is massive – we’re talking about roughly 50% of the global population, which would benefit from this. That’s an estimated $10T up for grabs. You see, blockchain technology does away with these complex middleman structures. Study this above presentation, and you’ll see that there are many ways of improving it, but don’t become part of the hype. Digital assets are disruptive and much more advanced than current technology, but the art of investing hasn’t changed – the key is still to invest in undervalued assets that have a favorable future. This is precisely why the next stage of this revolution is a consolidation era. There are too many projects, which are inferior in terms of their patents, technology, marketing, branding, managerial skills, and all the various components, which end up determining success. The proven projects will eat up the small fry in a merger phase, which has already begun, but I’d like to see the blue-chip companies, such as IBM, Microsoft, Oracle, and others joining the race, before I can safely announce that mass adoption is upon us. Along with electric vehicles and cannabis, there are no other industries, which possess better growth curves for the coming decade. As an investor or as a career path, these are sectors, which are hiring and in desperate need of capable people. I met my wife while serving in the I.D.F (Israeli Defense Forces). Every Israeli male is required to enlist for three years, either in a combat role or otherwise, and before the actual drafting, some are identified for roles, which require specialized skills.There isn’t any combative military position as demanding as that of a pilot. The rigorous course takes a full three years, after which you stay for an additional nine years of service, the 1st years of which, you are still in training mode. Every year, 10,000 teenagers are identified, while in high school, to try out and are served with requests to go through the various tests posed by the military to determine compatibility. The last hurdle before the actual course begins is a five-day training camp, in which around 600 teenagers, who have made it so far (9,400 didn’t), go through hell. This is a voluntary unit, so anyone can simply quit if it becomes too difficult for his or her level of resolve. Half of the participants are cut, so the three-year course is commenced with roughly 300 finalists (3% of the original 10,000 pool). In the end, 20% will survive it all, out of which 20% are selected for the combat missions. The statistics, then, are close to nil to succeed. I made it to the last 160 finalists; then was dropped like a leaf in the wind. The lessons learned along this journey were valuable for me, especially since they came very early for me at the age of 18. My love for flying didn’t cease, and today I hold a private license and regularly fly on single-engine planes to get aerial views of the scenery whenever I go. Next month, for example, I’ll be in Cancun and will enjoy the views of the Gulf of Mexico from up in the air. Falling short of glory: The most critical juncture of the course is a series of test flights, which determine how skilled you are. I stayed up two hours after everyone else went to bed to simulate the next day’s flight in my room. Concerning effort, it was clear that I gave it my all, but it wasn’t enough. No one wins every time. Falling short is a part of life, unless a person reaches perfection; so we all will fall short at some point. What I learned is that it doesn’t matter, as long as you use it as a springboard to your next conquest. Natural abilities are critical: Each person has a distinct ability to execute some tasks more naturally than others. Some of the pilots, who ended up being the most gifted in my class, worked the least. Some people are born with cognitive capabilities, while others need to work harder to develop at the same satisfactory speed. This taught me to stop fighting my natural weaknesses and to focus on my strengths instead. It forced me to discover myself, which is what I urge you to do on a regular basis. Reach daily conclusions regarding your actions throughout the day, and think big. If you do this, your alertness to opportunities will significantly increase. After a month, you’ll see solutions everywhere, instead of problems. Disorientation: An interesting exercise that instructors put trainees through is to block the surrounding view of the student, while he closes his eyes. In the meantime, the instructor moves the stick of the plane and banks it in a weird position. Then, he asks the student to open his eyes and level the plane off. Remember, the student can’t see anything, except for what’s exactly in front of him – the sides are blocked. This exercise teaches the student to make do with the reality presented to him. Many people wish they had a better starting point in life, or that governments would stop treating citizens with utter disrespect, or that their friends would appreciate them more, but the truth is reality is what’s in front of you, and you must work with it – not wish it was otherwise. Right now, what’s in front of you is a blockchain revolution, a cannabis legalization period, and an electric vehicles’ global phenomena. Work with the cards you’ve been dealt – seize opportunities. LOOK CLOSELY: Gold Can Go PARABOLIC!